After the article, be sure to check out Kathy speaking on how she started her interior design business here. Let’s cut to the chase: no one hires a designer who can’t present his or her ideas. It’d be like hiring a chef who can’t cook or a singer who can’t sing. Luckily, we happen to be experts in visually presenting ideas to clients, so today’s article will focus on just that. We’ll preface by saying that every interior designer is different. Not every designer approaches design the same way. 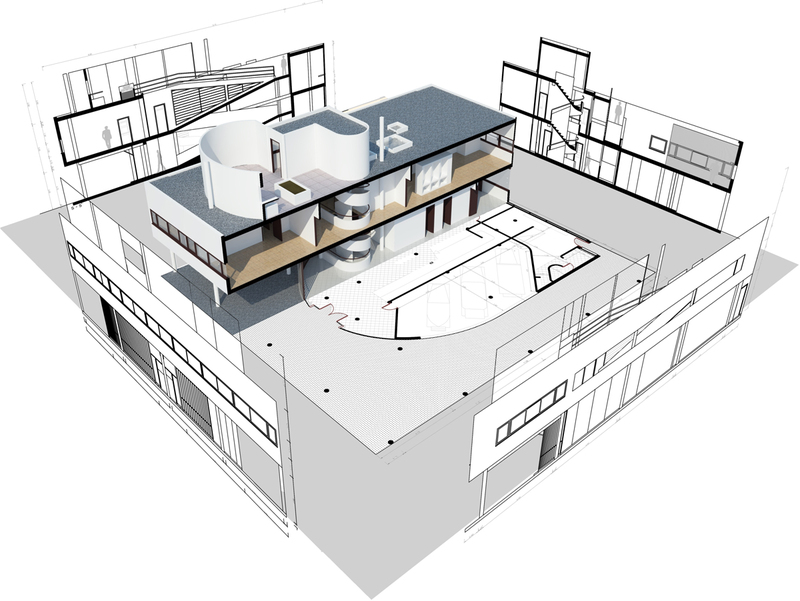 Below, we’ve outlined some of the strategies we’ve found useful while constructing design schematics for our design projects, but make sure to let us know your own thoughts and strategies in the comment section below! What is a design schematic? A design schematic is not the same thing as a mood board. Let’s start there. A mood board is an arrangement of images, materials, textures, fonts, and colors that evokes the style of a project or concept. For many, a mood board is the springboard for design creativity. The mood board you create should be an organized display of your thoughts and ideas, and as an end result, a board should then be a useful tool you can use to effectively communicate your design ideas to your client. 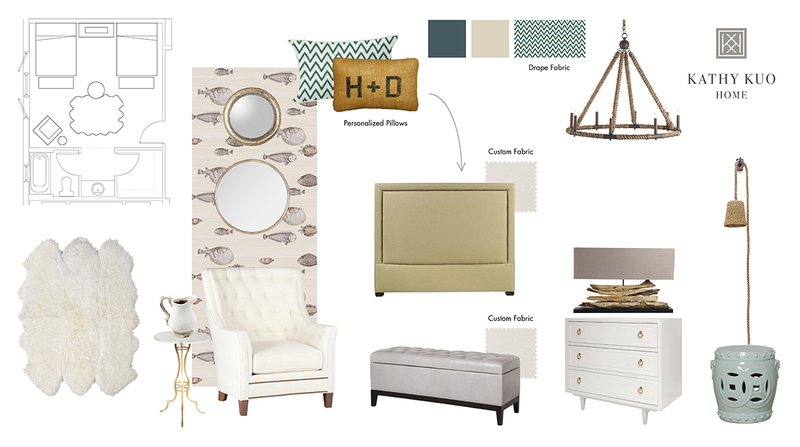 A mood board is what you’ll typically receive from a decorator, stylist, or e-design website (Except for our Design Bar. We provide design schematics, which we’ll explain in detail next). A design schematic is a complete room design similar to a mood board, but it includes a floor plan with furniture and decor laid out to scale. This is important to have for clients who aren’t just looking to update their home with some new wallpaper. 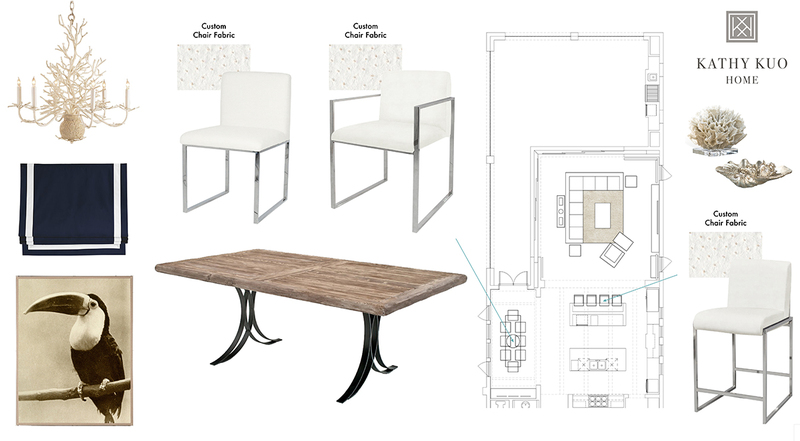 With a design schematic, you can show your clients the exact location and dimensions of every piece in their home in addition to architectural details and appliances. 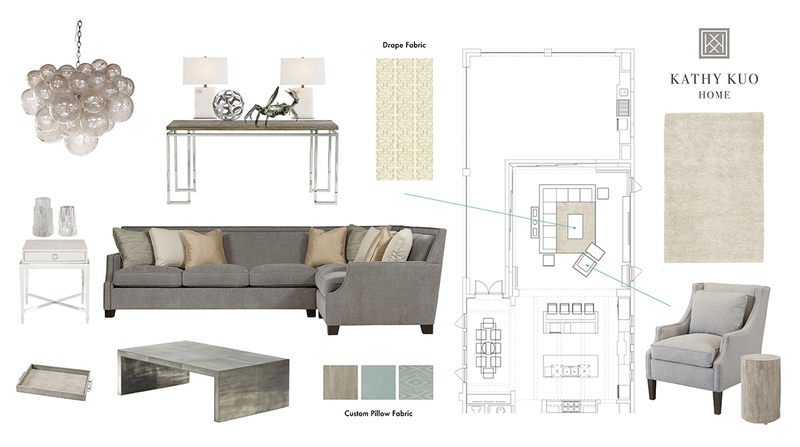 A design schematic provides clients with trust, and it’s what you’ll receive from us here at the KKH Design Bar or at another professional interior design firm. 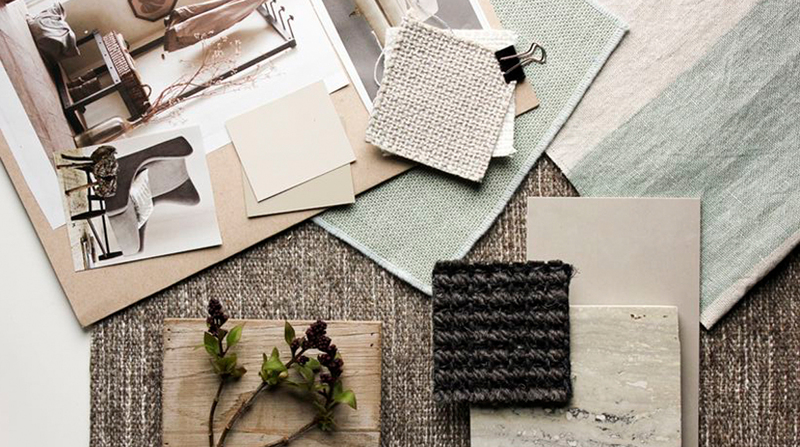 Mood boards are an ideal tool for editing down your design. You are able to mix and match design elements and remove and add ideas with ease. The design schematic is then the next step in which you can lay out your design in a comprehensible way. It also serves as a method for brainstorming or collaborating with clients and other architects and designers if need be. One of the most difficult parts of interior design, especially for your client, is envisioning what a space is going to look like at the end. The design schematic is a great solution for this problem. At the Kuotes, we like to start with a color that inspires us, a piece of fabric we’re fawning over, or even a photograph of our travels. But really, the opportunities are endless. Start with whatever it is that inspires you, be it a work of art or an outfit you find on a fashion blog. Where does our inspiration come from? Everywhere! But we curate all of our favorite pieces all on our site in seven unique collections: French Country, Industrial Loft, Modern Classic, Coastal Beach, Hollywood Regency, Rustic Lodge, and Global Bazaar. Another strategy is to use Pinterest to gather ideas for inspiration. Head over to our Pinterest page for plenty of design inspiration! In our opinion, it is important for a board to include the layout of the room. A layout provides the container for your creativity and allows for accurate furniture placement and scaling. 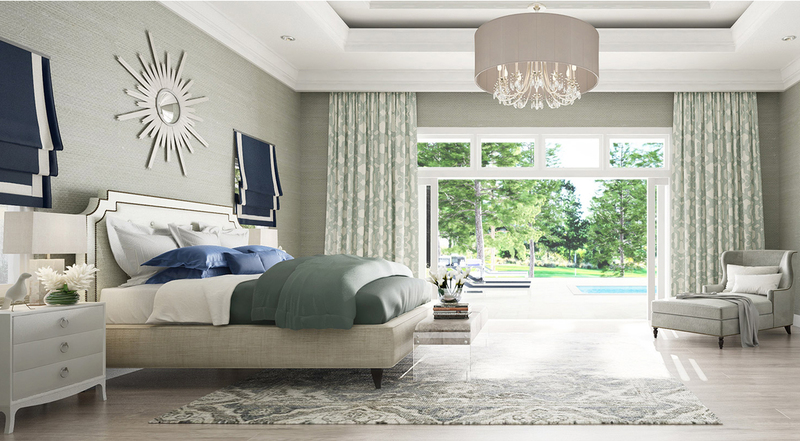 Creating your room layout can be completed in several ways, and your method should be dictated by your own preferences and skills. Our friend Philip Mitchell does FREAKING AMAZING hand sketches of his spaces. However, if sketching isn’t your forte and you want everything to scale, many designers put together a comp in AutoCAD or Rhinoceros 3D. These are computer programs used by many designers to map out rooms and accurately place furniture. We always encourage our readers to learn more and take classes in programs like AutoCAD; however AutoCAD is very technical and difficult to use without some proper training. If interior design school isn’t for you, we highly recommend the tutorials and lessons on Lynda.com. Or, just reach out to us at the Design Bar at hello@designbar.com, and we can create a to-scale design schematic for you! Go through fabric and color swatches and pin them to your board. Form an idea of which fabrics and materials are going to go with which piece. As designers, we frequently get questions like: What color should I use? What will this color look like in the room? Boards are the perfect solution for showing your client color in relation with other items they like. You should also include any floor tile, rug or upholstery material, or pattern that you want to highlight. Just call our office, and you can request fabric swatches and wood and upholstery samples from Kathy Kuo Home to help you decide on what’s best for your design. Pro Tip: Some designers like to build a hierarchy into their boards. For instance, if you really want a piece of tile you adore to be the standout aspect of the room, attach it to a piece of foam board and place it on the board so that it stands in the forefront and more prominently than your other design elements. 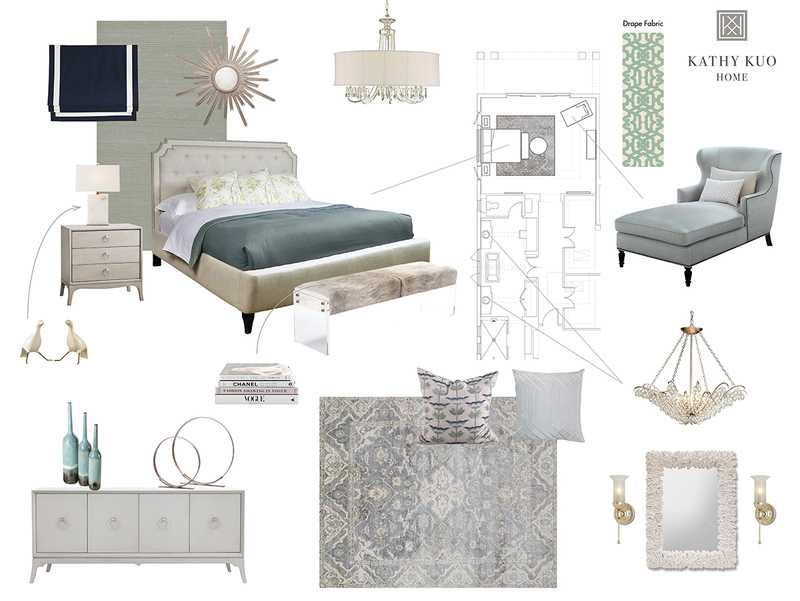 Other designers, such as our own Kathy Kuo, like to actually create separate boards for plans, fabrics, products, etc. Step #4 – Add Product! Make sure you know how your board is going to be presented. Will you be meeting your client in person, or do they want the board to be emailed and sent to a team of people? The answer will decide whether you produce an offline or online board. The distinction is not trivial. A physical handmade board will generally be more freestyle and require the extra visual bells and whistles to make it interesting to a client. An online design board should be tight and very easy to process, using clean lines and exact dimensions and scale (basically, a design schematic). Pro Tip: When making a physical design board, don’t be afraid to get… physical with it. Cutting up foam board and spray mounting cut-out images and swatches can be a bit of a chore, but it can be a powerful presentation tool (especially for older, more traditional clients). The tactile nature of collage-style design boards also enhance the tactile and emotive experience for your client. Use smaller foam board for larger corporate clients because your board will likely need to be left behind and passed through multiple hands and departments. Since we’re in the digital era, we typically present a digital design schematic as a PDF in addition to supporting tear sheets. Our favorite way to meet with clients is over a Skype or Join.Me call. Using this method, we can actually share our screen and literally orient and spin furniture around in real time and real scale until we’re both happy with the result. Do you need design help? Reach out to our Design Bar to get started on your next project with our full interior design services. Our pleasure. Glad you enjoyed it! thanks for this post it is very valuable to me. I have been thinking about getting an interior designer to help layout our home. I really appreciated how this talked about starting with a color that inspires. I will have to keep this in mind. Hi Max! Glad you found the article helpful! All the best! The best article. Thanks for sharing your wonderful site. Thanks for sharing nice blog post and amazing interior design ideas! article is very good regarding tips interior design. Highlighting fabrics, colors & materials seems to be a perfect example. Very helpful! I am random user to this blog.! But after reading this excellent article.! tips.. i will reach regular to this blog. It was so useful info shared.! Excellent post. I was checking constantly this blog and I’m impressed! Extremely helpful info particularly the last part ?? I care for such information a lot. Great work, I love making mood boards for clients as well. Question- Do you always ask permission to use the images that are on your board? I have started doing this a lot more and I often share my work online, but I am worried about copyright/image right laws. In the past I did not ask permission and used photos from google, but now that business is growing I have been more careful. Any experience with this? Hi Staci, thanks for reaching out. This is definitely a sensitive issue and something we’re learning more and more about as we also continue to grow. I’d say it mostly depends on how the image is used and who the image is shared with. If you’re just sharing inspiration on Pinterest or emailing directly with a client, it’s okay to do so. Designers and artists always get ideas and inspiration from other designers and artists, and you’re allowed to share photos already on the internet. If the photo is collaged on a mood board, the key is to make sure you’re not presenting the photos/ideas/designs as your own (always make sure to give credit to the photographer). However, if you’re using images on mood boards as part of a pitch to a large client, commercial client, or anyone else who will distribute the image publicly, I would ask permission for the photo. Additionally, if you are using the photos in any way to promote or market your business (on your website, social media, ads, etc. ), you DEFINITELY need to request permission and likely purchase rights to the image. In most cases, the rights to a photo is owned by the photographer or a licensing company. 1. When do you present the design to the client, exactly? After two or three rooms have been designed, etc? 2. Do you present an entire home design (finishes and furniture), say for a new build home all at once or do you schedule a few presentations throughout the duration of the process? 3. How soon after the client approves the designs in a written form do you begin ordering everything? 1. When do you present the design to the client, exactly? After two or three rooms have been designed, etc.? We always charge, design, and approve on a room-by-room basis. Starting with one room and getting it right makes it much easier to understand your client and develop a concept for other rooms belonging to the same project. The client should definitely sign off on the invoice/line item list of products before you begin ordering . Your idea to use a physical design board with more traditional clients is smart. Personally, I like to see the texture of something up close. Plus, you never know exactly what color you are seeing when using a computer screen. The only way to see what a certain swatch of paint or fabric will look like in a given room is to physically bring it there. Thank you so much, Melissa. These are really amazing Tips. such great design. Thank you for clearly defining the difference between the mood board and design schematic. One of the tips I learned in design school is to scale your materials to the amount used in your design. For example, the flooring sample will be larger than the sofa fabric sample, because you’ll have more flooring relative to your sofa. Also, layout your materials so those in close proximity show together (sofa fabric with your pillow fabrics). You have no idea that this post is a life saver for me. Thank you so much, for filling out each minor details off how to represent a design board. After working in the Architecture field for 13 years, I got really tired of having to gather all the architectural materials from a search engine, and then compile a sample board on layout software. It takes a long time and is cumbersome. Now I compile our architectural sample boards through Spec Ninja software. I can select from thousands of materials, products and paint chips and add them to my own design boards, edit those boards and export them for the client or municipality. Thanks for sharing the best posts they very help us. I g0t such a great information on this topic. You made a good site it’s very interesting one. Thanks for reaching out! We typically provide all of our design services (design schematics, layouts, renderings, etc) after we’ve consulted with the client and agreed on payment. As for the technical aspects of interior design, in today’s design world learning and working with design programs is necessary and expected for pretty much everyone in the trade. If you’re new to the programs, there are several resources you can use to learn (I really like Lynda.com as an easy online resource, but many schools, libraries, community centers, etc. offer classes you can take as well). Nice post. And I greatly enjoyed your thoughts. Nice Blog and amazing interior design! Always full of useful and helpful information.article is very engaging and informative, and I really enjoyed reading it. Thanks, admin share for your valuable knowledge with us. As a designer, we have to present our client like it. I agree with u. Nice blog..very useful information is giving to us. We’re so glad you found it helpful! Thank You for posting this on your blog! Very helpful! I always strive for a better presentation…. In the digital presentation what programs are used to clip and layer items on one page? Is this photoshop? If so is there an edition of photoshop that works best for interior designers? Is there an easy program to achieve the look you have provided on your mood boards? I am really very interested in learning the simplest way to create a digital board. Any advice is appreciated! We’re so glad you liked the article. For our blog posts/shopping boards/Pinterest graphics, we put those together on Photoshop, the current creative suite. When presenting boards to clients, we do all of our schematics on AutoCAD or on Illustrator with an AutoCAD plugin to ensure everything is to scale. Hope this helps! As a designer of wedding/event spaces, this was very helpful! Loved the tip to always start with the overall floor-plan to show the scale and flow of the room, BEFORE getting into specifics about colors and textures. Super helpful. Thanks!